The new JBL LS Series is a relatively upmarket range of speakers consisting of five models; three stereo pairs, plus a subwoofer and a centre-front model for home cineastes. All bar the subwoofer (naturally) share the same horn-loaded treble drivers, varying in their complement of bass and bass/mid drivers. 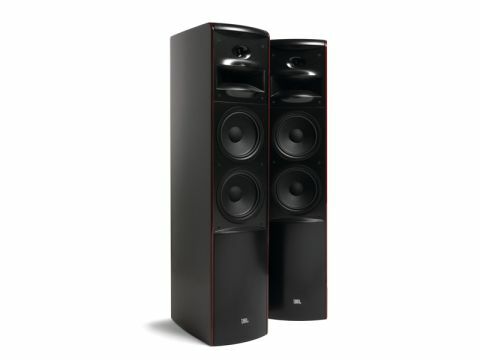 The £1,800 JBL LS60 is the middle of three stereo pairs and the smaller of two floorstanders. It's an attractive and very solidly built speaker, charcoal finished on front, back and sides, with a tapered plan view decorated by shaped and lacquer-finished veneered sides. The most unusual feature though, is the use of horn loading for the higher frequencies. Four drive units are arranged in a three-and-a-half-way configuration. Two 165mm drive units with 130mm paper cone diaphragms operate through the bass region, assisted by a large reflex port tuned to 42Hz. The lower driver is rolled off gently at 6dB/octave above 400Hz; the upper one continues on up to 2kHz, whereupon a 50mm titanium dome compression driver, loaded by a bi-radial horn, comes in with 24dB/octave slopes. This unusual unit, clearly related conceptually to the rather larger horn used in the redoubtable K2 S9800 'flagship' model, operates across the next two octaves and then a much smaller horn tweeter takes over above 8kHz. A bonus with these horn units is that their diaphragms are well hidden from prying fingers. Twin terminal pairs offer a bi-wire/bi-amp option and the speaker comes with blunt studs or rubber feet rather than spikes. Stability is not great as no separate plinth is provided to enhance the footprint – a label on the back is considered adequate warning against tilting! Clearly intended to be sited well clear of walls, the bass here errs on the full side, adding a little thickening to male speech and having a tendency to thump on some material. Ultimate weight and scale is a little lacking on the JBL LS 60, but it's nonetheless satisfyingly firm, solid, authoritative and powerful, all the while demonstrating good grip on musical material. The LS 60 is not the smoothest or most neutral performer. Timing is slightly slow and smeared and dynamics sound a little constrained, but it handles high power levels with more than ample headroom and seems to have plenty of loudness capability in reserve for those with powerful amplification. Although its overall character is noticeably laid back, it also somehow manages to avoid sounding obviously shut in. As a result, the sound shows a degree of restraint alongside an impressive freedom from any aggressive tendencies, even when the volume is being pushed hard. However, the JBL LS 60's major strength lies in its exceptionally fine image precision and focus with excellent depth perspectives. The listener really feels as though he or she is afforded a clear window onto the recording venue. That's presumably a consequence of the controlled directivity properties of the horn drivers, which favour direct over room-reflected sounds, and deliver a sound quality that has a distinctive character rather different from conventional direct radiators and none the worse for that.